Converts a 29pin DVI-I input on an LCD Monitor to a standard 15 way High Density D type socket. 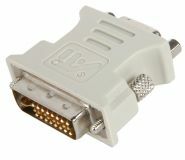 A DVI-D 25 way connector has 3 rows of 8 (small flat) pins angled at 45% with a flat spade like connector at one end. A DVI-I 29 way connector is as described above with 4 extra smaller flat pins, two above the spade connector and two below it. Special Offer Price: £7.00 no VAT to pay!